Brittany Lang won the U.S. Women's Open on Sunday, but another ruling and USGA failure owned the spotlight in the final hour. The USGA's ignominious summer continued on Sunday night, just three weeks after it was eviscerated for its bungling of the Dustin Johnson ruling at the U.S. Open. The U.S. Women's Open went to a three-hole aggregate playoff between Anna Nordqvist and Brittany Lang at CordeValle. Both players were even-par after the first two holes -- or so they thought. 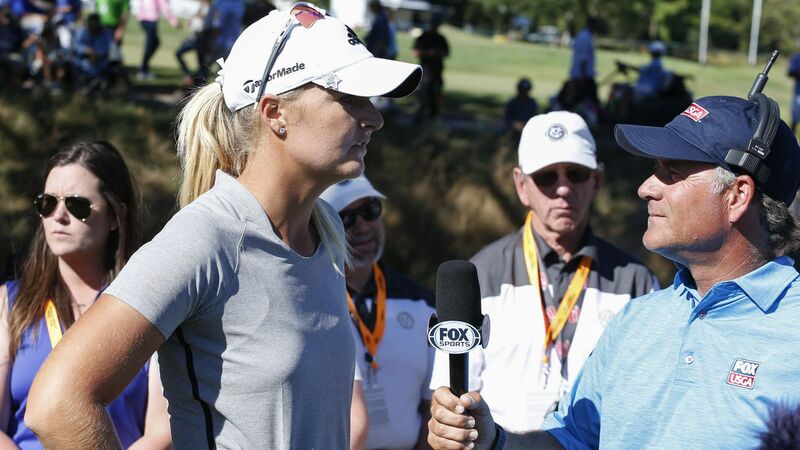 As the two walked up the 18th, high-def video review on the FOX broadcast brought to light a clear Nordqvist penalty from the 17th hole. As she went to address and hit a shot from a fairway bunker on the 17th, Nordqvist ever so slightly touched the sand, moving a few grains before taking her club back for her swing. That's grounding the club and a two-shot penalty. Notifying the players took a bit too long. 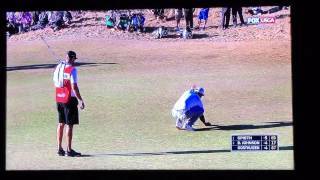 So it's a penalty, but the problem was AGAIN how the USGA fumbled notifying the players. It takes time to review things back at the clubhouse or rules trailer or wherever the hell they're looking at this, but the rules officials did not notify the players until their third shots going in the final 18th green. At that point, a two-shot swing all but ends the championship. It took way too long for a rules official to notify the players. The strategy obviously changes for both when they find out they're not tied, but rather two shots apart. You run to the 18th tee ... or more likely 18th fairway ... or some spot that's before the players are hitting their third short shots into the 18th green. The problem with notification in the DJ drama was a) he was originally notified it was not a penalty on the spot at that 5th green b) he was then told on the 12th tee something may or may not have happened and they were revisiting it and c) a determination would be made at the end of the round, but still go play your final seven holes of the national championship not knowing what the ruling is or what your score is. They notified the players OUT OF SEQUENCE. It took forever but the more unforgivable screw-up in the notification process occurred when the rules official stepped in and told them out of sequence. Nordqvist hit her third shot into the 18th green. The rules official jumps in and tells her she's been assessed a two-shot penalty and is no longer tied. The same official then walks across the fairway and tells Lang BEFORE she hits her third shot. They were not notified in sequence at the same time, and FOX analysts Paul Azinger and Juli Inkster jumped all over it. Lang pulled a different club, altered her strategy and played conservatively ... lofting a shot way out to the right side of the green, opposite the hazard that sat in front of the left side, where the pin was tucked. That's not the play she probably would have made had she been under the impression she was tied. She confirmed that after the round. Nordqvist did not have that benefit before she played her third shot, which probably would have been more aggressive if she'd know she was down two and might have needed to hole it or at least stuff it close for a birdie putt. As you can imagine, social media lit up again as the USGA mishandled the notification process. Then at the trophy presentation, USGA president Diana Murphy repeatedly called the new champion "Bethany." Her name is Brittany. And so the USGA's miserable month continued. The right person won the championship, but just like at Oakmont, the win will be overshadowed by the USGA's stumbling in the critical moments of a Sunday final round.